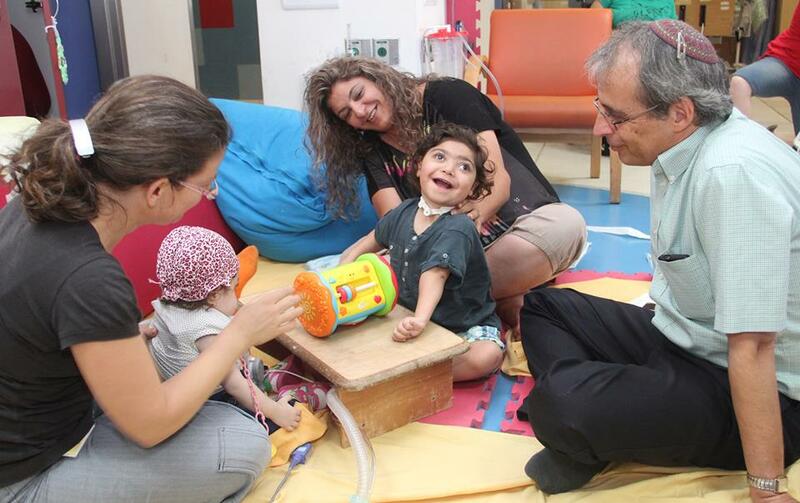 The "therapy play area" is an open indoor play area in the center of the Department of Respiratory Rehabilitation, and has been in daily operation for the last 4-6 months, at the initiative of physiotherapist Ofra Ginnat. In the "area", nurses and therapists guide and supervise the parents throughout the morning as they play with their children, on floor mats and beanbags. The idea behind the "area" is that the informal interactions between children and parents while playing in a group play setting have a very positive impact on a child's physical, emotional, social and psychological development. Because this is a completely new approach to rehabilitation of ventilated children, I wanted to experience first-hand how the "area" worked. So I joined on as one of the therapists for the morning. I found myself swallowed into a world of its own, full of communication between children and between parents. The therapists would suggest an activity, and the parents would then "play" it with their child, and also with the other children in the group. I could see how parents learned from watching what other parents and children were doing. And it was clear that both the children and the parents were having a lot of fun. So much so that I wasn't aware of the fact that I was sitting on the floor for two hours. The area was a hive of activity and smiles, with a strong feeling of camaraderie between parents and children of very different backgrounds and cultures. The parents were keen to tell me how valuable they thought the experience was for their children. I was left with the feeling that this new approach - more fluid, informal, social and enjoyable than standard one-on-one therapy sessions – could change the way pediatric rehabilitation is practiced in the future in Alyn, in Israel, and even in other countries.